When I’m in Afghanistan, I have what some people may consider an odd habit: closely inspecting memorial tributes developed by the troops, for the troops. They come in many sizes, shapes and colors. There are murals. There are photographs. And there certainly are battlecrosses, which serve as the centerpiece of many memorial ceremonies that deployed Marines hold for their fallen brothers and sisters. Each of these tributes captures a story of sacrifice, pain and sadness. Conversely, they show a sobering sense of pride in the honor and dedication displayed by those who gave the last full measure of devotion. I suppose that’s why I visit these memorials while embedded. It’s not only to get a sense for what I’ve missed, but to remind myself how difficult war is on all involved, and the sensitivity required to cover it as a journalist. Life can change for all of us while downrange in one terrible moment, and each respectful tribute built captures that. When I arrived in Afghanistan’s Sangin district last month, I was not surprised to find a series of tributes on Forward Operating Base Sabit Qadam, headquarters of 1st Battalion, 7th Marines, out of Twentynine Palms, Calif. The base, formerly named FOB Jackson, has served as ground zero in a fierce fight with the Taliban that has killed more than 50 Marines and 100 British troops in the last few years. In a stone court yard at Sabit Qadam sits a stone monument that British Forces dedicated to their fallen. Shiny metal plaques recall their lost men just outside the entrance to 1/7’s combat operations center. Nearby, there’s a series of murals painstakingly painted on a dusty wall. 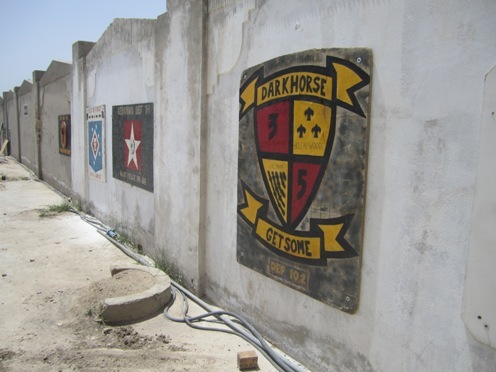 It memorializes the work of 3rd Battalion, 5th Marines, out of Camp Pendleton, Calif., and other units that have sacrificed heavily in Sangin since Marine forces arrived there in summer 2010. To the north in Kajaki district, there’s also a sobering memorial at FOB Zeebrugge, a mountainside base that I wrote about here. 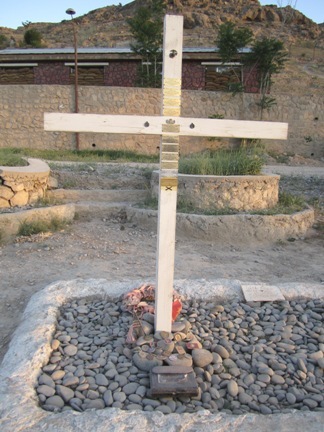 Two white crosses stand proudly in a bed of stones on the base. One memorializes fallen Marines, while the other recalls fallen British troops. Each cross has a series of metal plaques on it, listing the men who died and their units. The memorials can eventually blend into the woodwork, but at least a handful of Marines stopped at it every day I was at Zeebrugge. Some quietly made the sign of the cross after quietly reflecting. Others touched the plaques gingerly, or left behind small tokens of appreciation. Beneath the crosses, an array of military challenge coins sits unassumingly. Commanders frequently give them to troops as a token of thanks, so it makes sense that they’d be left in a place to reflect and do just that. The array includes the coins of battalion commanders, sergeants major — and Commandant Gen. Jim Amos. In the photograph below, his coin is gold and nearly square, with the commandant’s logo emblazoned on the likeness of a red flag. 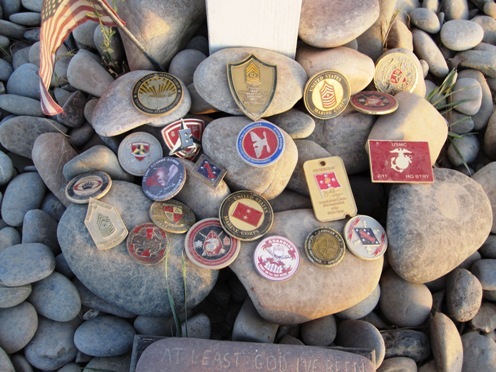 Most of those challenge coins have sat quietly on that bed of stones for months, if not years. No one dares take them, however. They’re meant for others who cannot do so anymore. On this Memorial Day weekend, I’ll be thinking of these tributes in Afghanistan — and the U.S. troops they honor. After 10 years of war, it’s the least any of us can do. This was really beautiful to read, and i think every american should pay tribute to a fallen soldier, as well as stand behind our troops whether ur in support of war or not. i stand behind them, currently my boyfriend is there in afghanistan, he is in the army. after reading this it brougtht tears to my eyes. god bless the us service men and women, those who died serving this country in my eyes are heroes as are those who currently serve. may god bring our men and women home from afghanistan soon, and safely,until then this woman here will pray for them as i always do, and keep them in near thought always. god bless them and those reading this..
My son is currently in Sangin. 3rd deployment, 2 previously in Iraq. Thank you for the reports from the region. May God Bless those men and their families. Good Job Armed Forces. Thank you for your service. May God Keep You Safe. Just an Fyi mygardencross.com builds and sells memorial crosses to honor the fallen and your family members that have passed. Thank you ,we are proud of you and your sacrifice.